My mostly-vegetarian teenage son has been trying to get me to make BBQ Pulled Jackfruit for some time now. After putting it off for as long as possible, because first of all what the hello is jackfruit and upon explanation, Bleh! why would some weird, huge fruit related to figs be able to actually taste like pulled MEAT?! But recently (sorry for digression) I finally bought a couple cans at Trader Joe’s (you can also get it at most Asian markets) and made his day when I told him I was going to give it a shot (still with skepticisim). 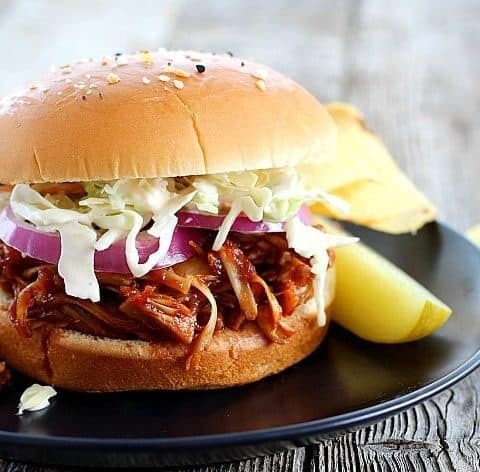 Aaaand… let’s just say- upon tasting the pulled jackfruit, my husband would’ve thought he was eating a regular, tender, juicy, pulled PORK sandwich if he hadn’t known that Ryan would not be eating it if it contained meat. And this skeptic actually LOVED it and now would urge you to give it a try even if you are not vegan or vegetarian. 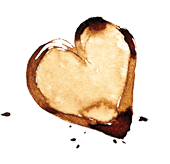 Here are my fantastic reasons; it will totally fill your craving for a nice barbecued pulled meat sandwich; it’s a cinch! to make, saving you tons of slow cooking and shredding time that’s required to get a big hunk of meat fall-apart tender; and the calorie comparison is crazy-significant. Jackfruit only has 45 calories in a one cup serving (without the sauce and seasonings). Pork shoulder has nearly 400 calories for the same amount. Here’s what the jackfruit looks like right out of the can. Some of the pieces don’t exactly shred. Leave them in because they’re still super tender and won’t deter from the pulled texture. There might be a couple of pieces that look like seeds (probably are the seeds). Again, just leave them. Really, you’re gonna be pleasantly surprised. 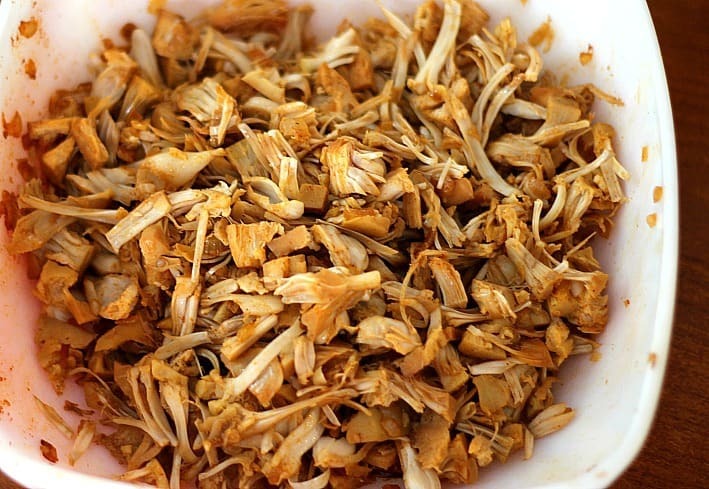 I shred the jackfruit with my hands, as I do for any pulled or shredded meat. Here it is after shredding and with the seasonings, for even more flavor, before pouring in the barbecue sauce. If using store-bought, use a good one. If you’d like to make your own, I have a fabulous recipe for barbecue sauce. If the link for that recipe is too involved for you but you still want to make homemade, this Neely’s BBQ Sauce Recipe is the easiest and one of the best I’ve ever made. Seriously, doesn’t this look like the real deal? And it tastes delicious as well. 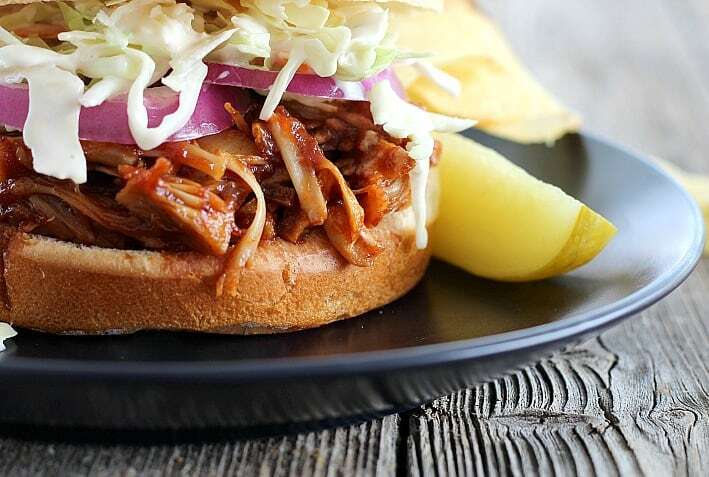 With how easy BBQ Pulled Jackfruit is to make, you can offer an option to your non-meat-eater friends at the next cook out or Super Bowl party- or serve it for anyone looking to trim their waistline but still satisfy that messy, smoky, barbecue craving. This recipe makes a good quantity and the leftovers tasted just as great reheated several times over during the week (my son ate one every day after school until it was gone). I’m going to try it for shredded taco filling next. Stay tuned for that. Jackfruit provides a close imitation to pulled or shredded meat and this becomes an excellent substitution for non-meat eaters. When shredding the jackfruit, it's easier to do if you use your hands. Some of the pieces won't shred and it's totally okay. 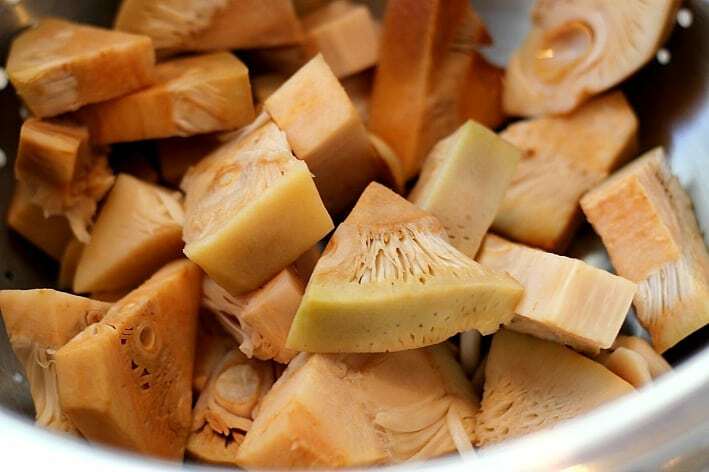 The jackfruit has a tender "juicy" bite. For the Jackfruit: Rinse, drain, and thoroughly dry the canned jackfruit. In a medium-sized bowl, mix together the dry barbecue seasonings, add the jackfruit and toss to combine. In a large skillet, add mild oil and heat to medium. Once oil is hot, add the onion and cook until just beginning to caramelize. Add the garlic and cook until fragrant. Add the seasoned jackfruit and cook for 5 miutes, until it begins to get some color. Begin to break it up with the back of a spoon. It won't break up completely here but just kind of soften apart. Remove the jackfruit from the heat and let cool until you can touch it with your hands. Using your hands or two forks, start to pull apart the jackfruit to shred it. Some of the smaller pieces won't shred, that is totally fine. They're still tender and will be great. 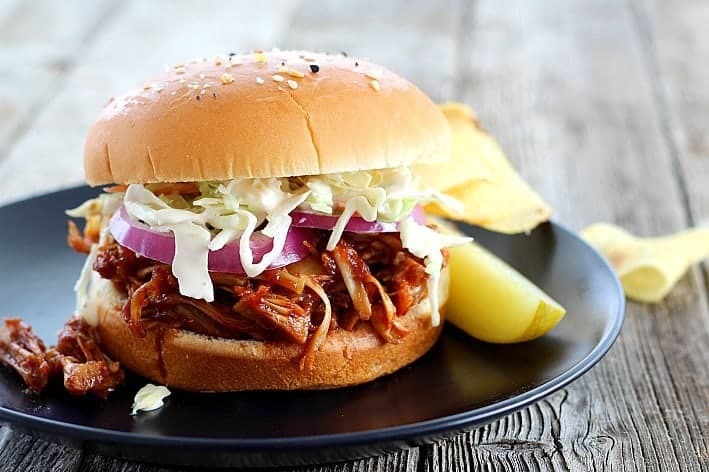 Start with one cup of barbecue sauce and mix with the shredded, seasoned jackfruit. Add more if you want the mixture more "saucy". Cook, stirring, just until heated through. 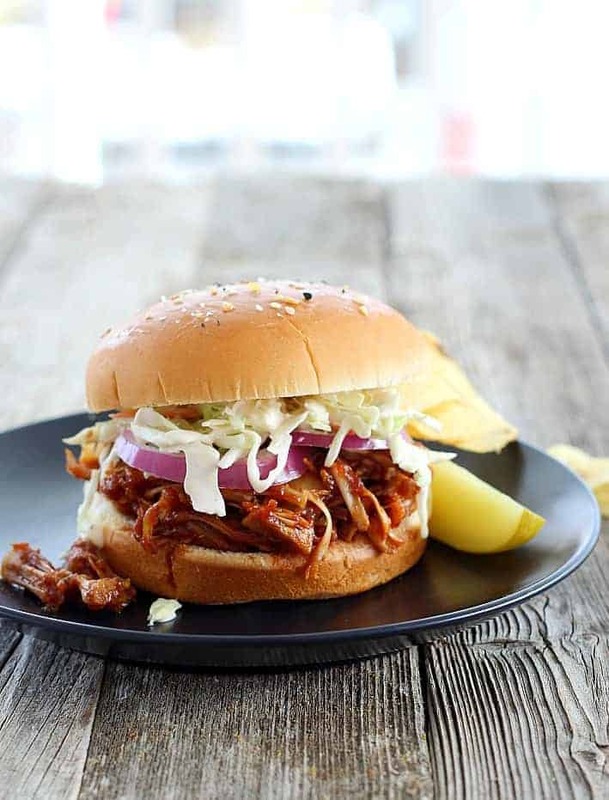 Serve topped with more barbecue sauce, coleslaw, pickles, and red onions, either on a bun, over rice, or in a tortilla. Store any leftover jackfruit in the refrigerator for up to one week. When reheating, you might need to add yet more barbecue sauce. Canned jackfruit will come in either brine or water. Either is just right. It also comes in a sweetened form which you do not want for this recipe. Beautiful Photo! Definitely going to make this one, Thanks Sally! Sorry just saw the part where you said it reheats well! What do you serve with this besides coleslaw? Trying to think of easy or make ahead sides. Hi! I am so excited to see this recipe. My husband had read about jackfruit and wanted to try it but we’ve never known what to do with it! We are having vegetarian friends over this weekend so I was thinking of trying this. Would you really say this is only 20 minutes? We will be quite rushed for time and I’m trying to decide if I’ll have enough time to cook. Does this reheat well? Any thoughts?